I got the patterns from two great books that I have, "Sewing Dolls' Clothes" (27 projects from the Dolls' House Magazine) and "Making and Dressing Dolls' House Dolls" (by Sue Atkinson). I cut the pattern pieces from thin cardboard and glued the fabric on them. 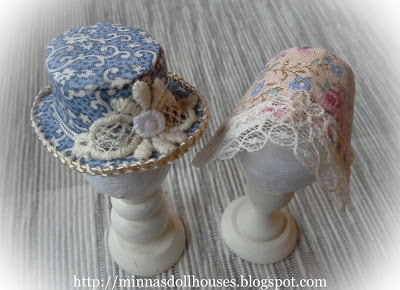 I very much enjoyed making the hats and I want to make more! I think I will try to make a straw hat next. Fabulous, I just love that blue hat. The fabric really suits the style.